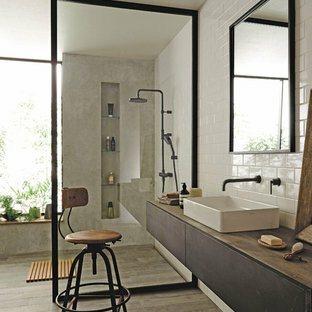 Scopri su Houzz la più vasta collezione di foto e idee per: Doccia moderna. Sfoglia 73 foto sul tema e lasciati ispirare per il tuo prossimo progetto. 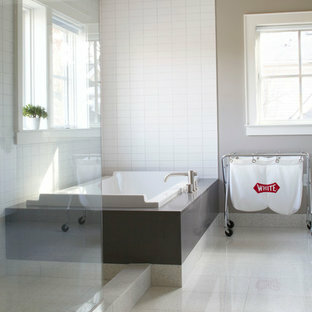 Di William Duff Architects, Inc. This sixth floor penthouse overlooks the city lakes, the Uptown retail district and the city skyline beyond. Designed for a young professional, the space is shaped by distinguishing the private and public realms through sculptural spatial gestures. Upon entry, a curved wall of white marble dust plaster pulls one into the space and delineates the boundary of the private master suite. The master bedroom space is screened from the entry by a translucent glass wall layered with a perforated veil creating optical dynamics and movement. 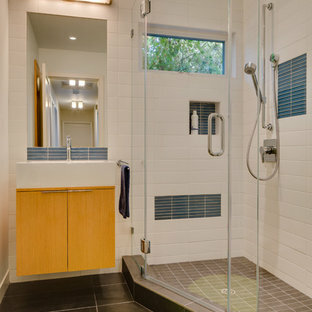 This functions to privatize the master suite, while still allowing light to filter through the space to the entry. Suspended cabinet elements of Australian Walnut float opposite the curved white wall and Walnut floors lead one into the living room and kitchen spaces. A custom perforated stainless steel shroud surrounds a spiral stair that leads to a roof deck and garden space above, creating a daylit lantern within the center of the space. The concept for the stair began with the metaphor of water as a connection to the chain of city lakes. An image of water was abstracted into a series of pixels that were translated into a series of varying perforations, creating a dynamic pattern cut out of curved stainless steel panels. The result creates a sensory exciting path of movement and light, allowing the user to move up and down through dramatic shadow patterns that change with the position of the sun, transforming the light within the space. The kitchen is composed of Cherry and translucent glass cabinets with stainless steel shelves and countertops creating a progressive, modern backdrop to the interior edge of the living space. 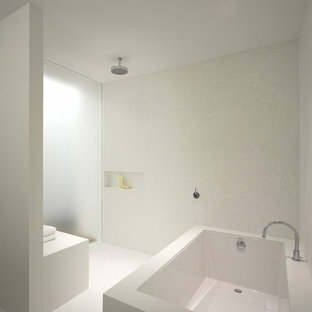 The powder room draws light through translucent glass, nestled behind the kitchen. Lines of light within, and suspended from the ceiling extend through the space toward the glass perimeter, defining a graphic counterpoint to the natural light from the perimeter full height glass. 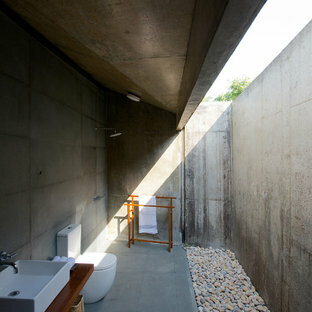 Within the master suite a freestanding Burlington stone bathroom mass creates solidity and privacy while separating the bedroom area from the bath and dressing spaces. The curved wall creates a walk-in dressing space as a fine boutique within the suite. The suspended screen acts as art within the master bedroom while filtering the light from the full height windows which open to the city beyond. 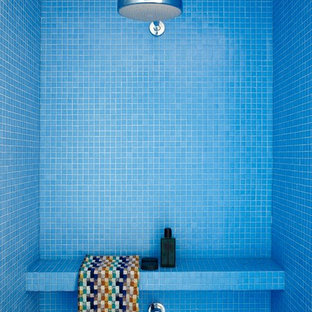 The guest suite and office is located behind the pale blue wall of the kitchen through a sliding translucent glass panel. 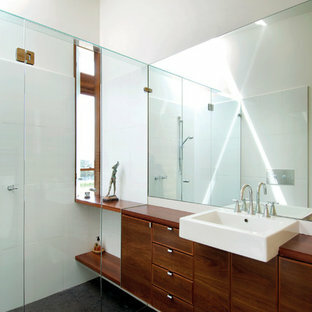 Natural light reaches the interior spaces of the dressing room and bath over partial height walls and clerestory glass. 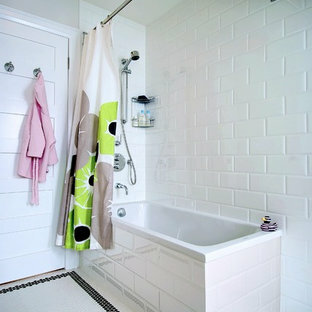 White Béton Ciré Wall Finish, waterproof and stylish.